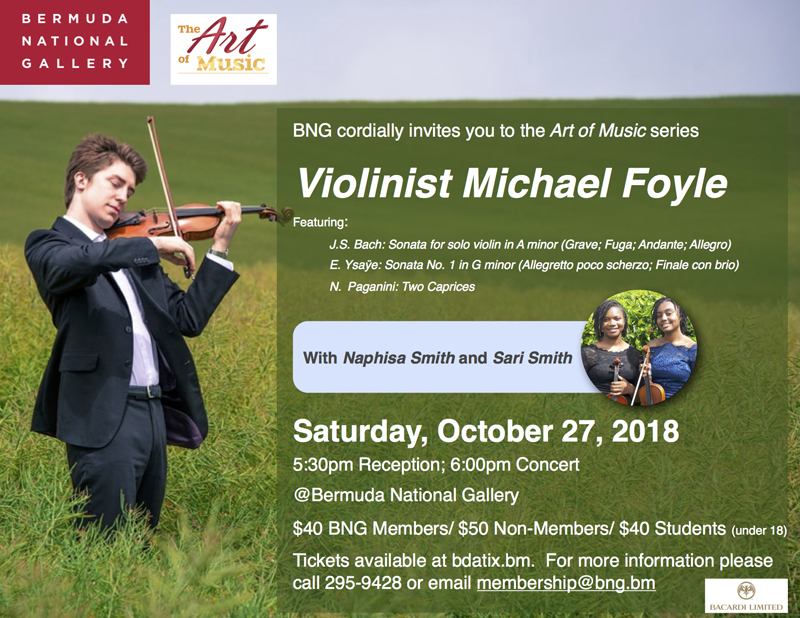 Bermuda National Gallery’s “The Art of Music” series will be hosting a fundraising evening of music featuring internationally acclaimed violinist Michael Foyle, with opening performances by Bermudian violin duo Naphisa and Sari Smith. For the Art of Music event, Mr Foyle will play: J.S. Bach: Sonata for solo violin in A minor [Grave; Fuga; Andante; Allegro], E. Ysaÿe: Sonata No. 1 in G minor [Allegretto poco scherzo; Finale con brio], and N. Paganini: Two Caprices. The event will take place October 27 at Bermuda National Gallery, City Hall with a reception at 5:30pm and concert at 6:00pm.